This is one of the most advanced products "pre-workout" supplements on the market. It provides real support in the pursuit of excellence - increased strength, stamina and improves the pump on training! 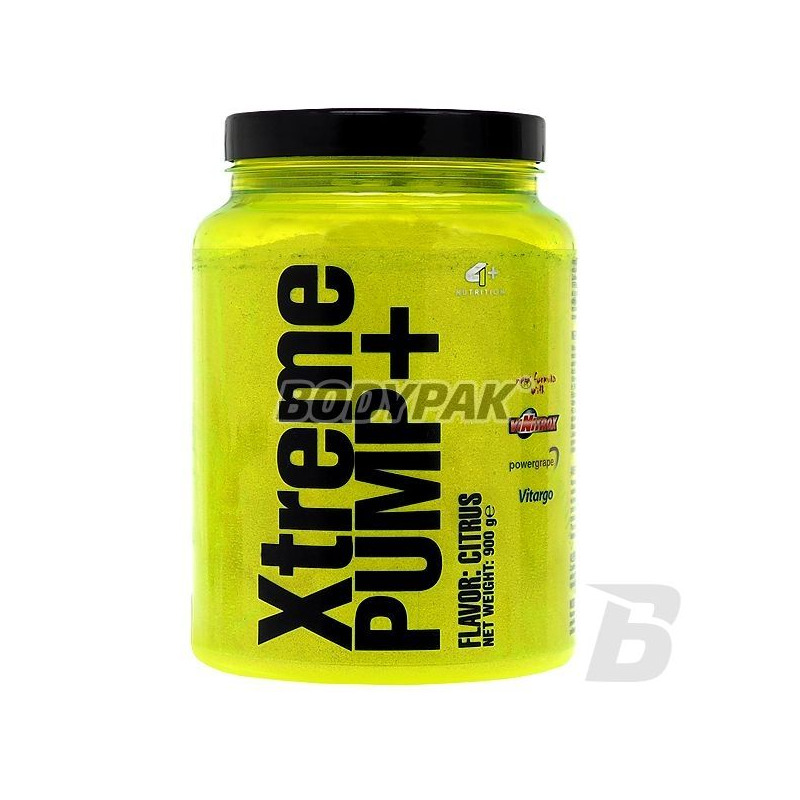 4+ Xtreme Pump + - is now one of the most advanced products "pre-workout" supplements on the market. 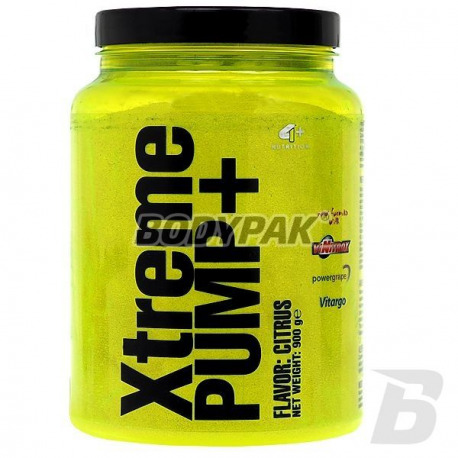 A blend of about twenty nutrients to improve the volume and intensity of your workouts. Besides, as one of the few are able to put your body in a state of anabolism immediately after exercise. This happens due to a large amount of branched chain amino acids combined with creatine and glutamine. For stimulation and increased productivity are the responsibility of beta-alanine, arginine, taurine, tyrosine and caffeine they keep your body on full alert allowing you to perform more reps with more weight than usual. - Vinitrox is patented by Nexire set only natural ingredients to increase blood supply to the muscles (ie. The pump) and the regeneration through antioxidant properties. - Powergrape is a patented plant extract from grape to prevent oxidative stress and muscle damage, also has an impact on improving the overall well-being. - Vitargo is a source of rapidly absorbed and at the same time complex carbohydrates. VITARGO® leaves the stomach 130% faster than dextrose and maltodextrin, so the process of initial digestion does not interfere in the exercise training. With VITARGO® muscle gain instant access to easily and securely release of glucose, incomparable with other simple and complex carbohydrates. With VITARGO® you can forget about the heaviness or indigestion that accompanies eating large amounts of simple carbohydrates. Składniki: VItargo (maltodekstryna z jęczmienia), chlorowodorek l-argininy, alfa-ketoglutaran l-argininy, monohydrat kreatyny, l-glutamina, tauryna, alfa ketoglutarankreatyny, cytrynian magnezu, monohydrat dekstrozy, substancja przeciwzbrylająca: wodorotlenek potasu, l-tyrozyna, l-leucyna, regulator kwasowości: kwas cytrynowy, barwnik: kurkuma, l-histydyna, l-izoleucyna, l-walina, aromaty (pomarańczowy i cytrynowy), witamina C (kwas l-askorbinowy), kofeina, substancje słodzące (sukraloza, sacharyna), witamina B6 (chlorowodorek pirydoksyny), witamina B2 (ryboflawina), witamina B1 (chlorowodorek tiaminy), VNitrox (sproszkowane owoce jabłek i winogron). Czuć działanie już od 1 porcji - kupuję co jakiś czas i działa zawsze tak samo dobrze. Na prawde działa zwiększając pompe mięśniową - warto spróbować!